Congestion is already a major issue in the UK, but with a rising population, lower oil prices and economic growth, congestion is set to increase significantly over the next few years. UK Gov (2015 report) state they predict road congestion to increase between 19% to 55% growth between 2010 and 2040. The UK (especially in South) has a high population density. Building new roads is either not possible or undesirable because of the desire to protect remaining green spaces. With limited supply of roads, rising demand for travel – both car and HGV use will see congestion rise significantly. Longer journey times, which has both economic and time cost for business and consumers. Air pollution from burning fuel in jams. Lost business for city centre shops who see customers put off travelling due to congestion. The growth of cycling in London is at least partly driven by gridlock on London roads. For commuters weighing up different options for travel to work, the higher the time lost through traffic jams, the more attractive the alternative cycling is. 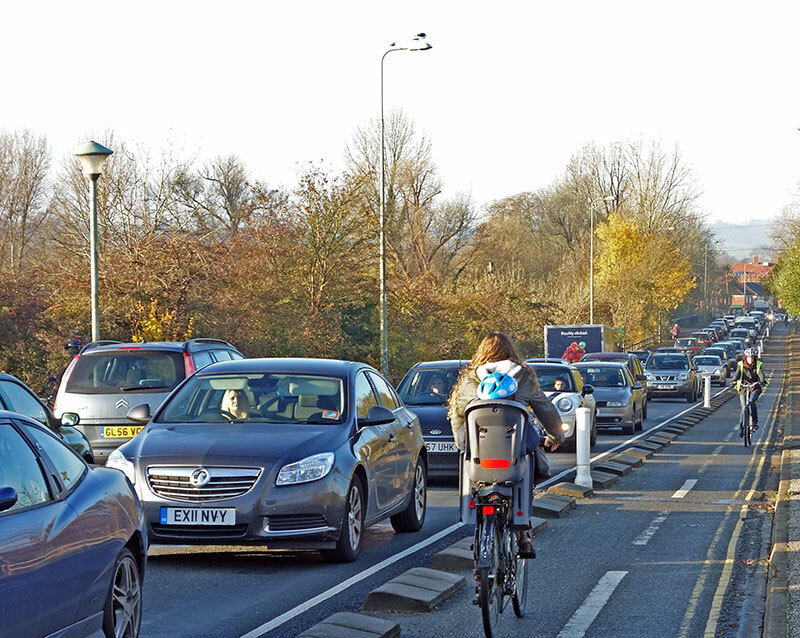 Congestion at peak times in Oxford is a big incentive to cycle into work. This is helped by a a limited and patchy offering of cycle lanes. (I wouldn’t call it a network as that would imply it is fully integrated). But, in some places it is just enough to help cyclists avoid the worst congestion. In a sense congestion does became self-regulating. As time taken to drive in city centres increases, the more people will be tempted to seek alternative ways. 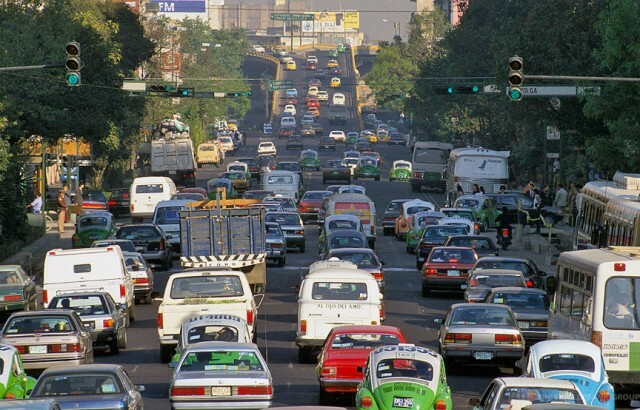 Though if there aren’t reasonable alternatives, you can end up with serious gridlock, like you can see in some cities. The joy of beating congestion. I have to admit, I get a real joy from cycling along a cycle path and avoiding traffic jams. But as a motorist I really dislike being stuck in traffic jams. I suppose if cycle rates increase so much, it has it’s own congestion. But, generally this is much less serious because of less space taken up. Does cycling cause congestion itself? I remember hearing a Top Gear commentator complain that cyclists increase congestion because they are slower moving and motorists have to travel slower. I seriously doubt this. 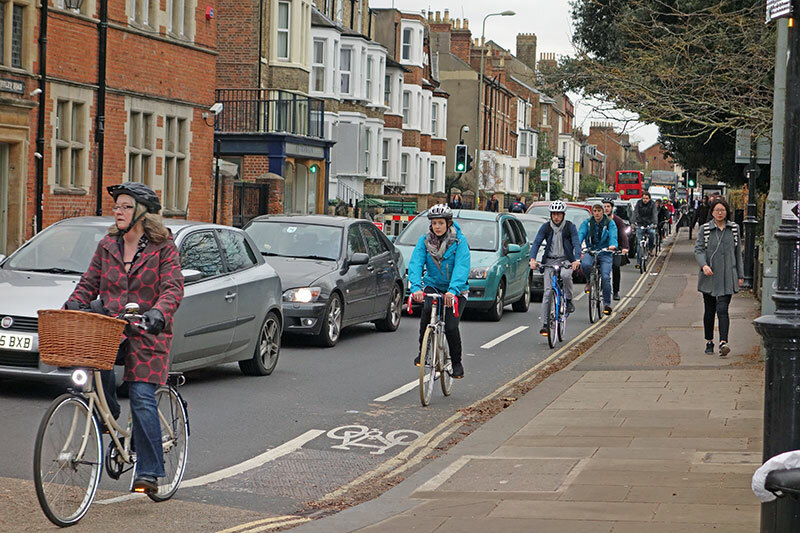 If nothing else look at the pictures of Oxford at peak hour and imagine every cyclist in a car and the relative more space they would take up. See space taken by cyclists. If every Oxford cyclist drove a car, I’m sure the city would have really bad gridlock at peak hours. 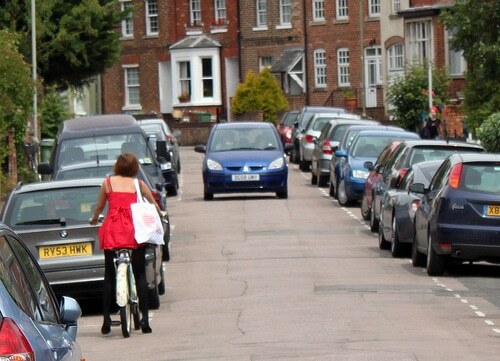 Bicycles take up much less space and are much easier to overtake than other cars. Cars rarely take more than a few seconds to overtake a cyclist (I know because it happens every day). Even if you have to wait 10 seconds to over take a bike, you can soon catch up the back of other traffic on the road. As a motorist I can’t say my journey has ever had any serious delay because of cyclists. 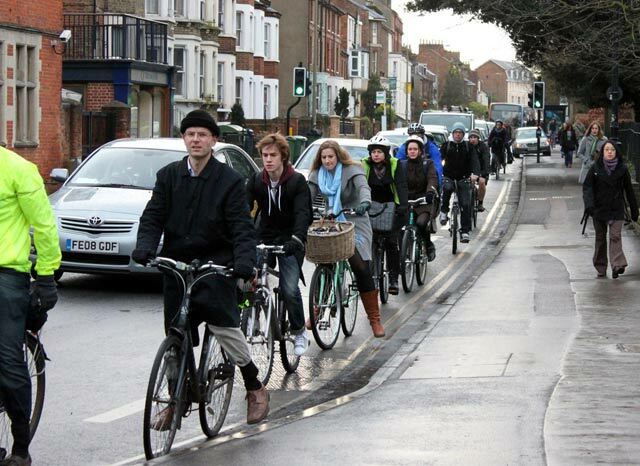 Will congestion always lead to increase in cycling? Congestion is no guarantee that you will see a growth in cycling. Some of the cities with the worst levels of congestion – e.g Mumbai, Beijing have seen falling rates of cycling because there is a lack of suitable infrastructure for cyclists. It is possible that congestion which makes cycling feel less safe. There is terrible congestion in New York, but would I feel safe cycling on America’s six lane roads with the way Americans drive? It’s a tough choice. For a city commuter, higher congestion is providing an incentive to take up cycling. Even city planners are starting to take more seriously the need for alternatives to the car, and are given greater consideration to cyclists in cities. 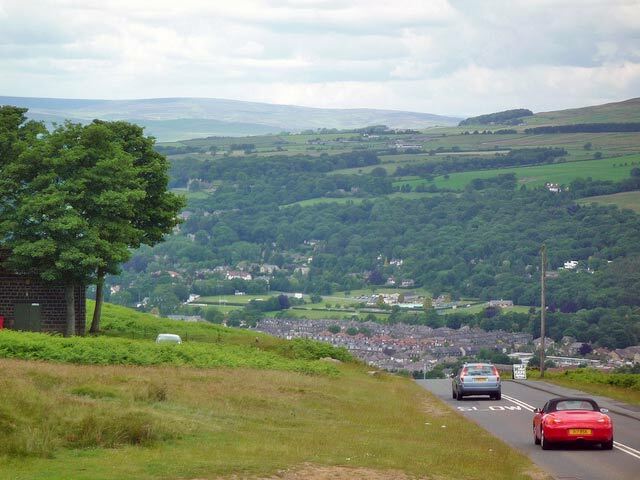 Cow and Calf – beautiful cycling climb, but these days spoilt by traffic levels trying to avoid congestion on the A65. However, a downside in the growth of traffic levels is that in rural areas, increasing traffic volumes are making cycling less attractive. The higher traffic levels are not enough to cause gridlock in the cities, but they are enough to change the traffic density of roads. 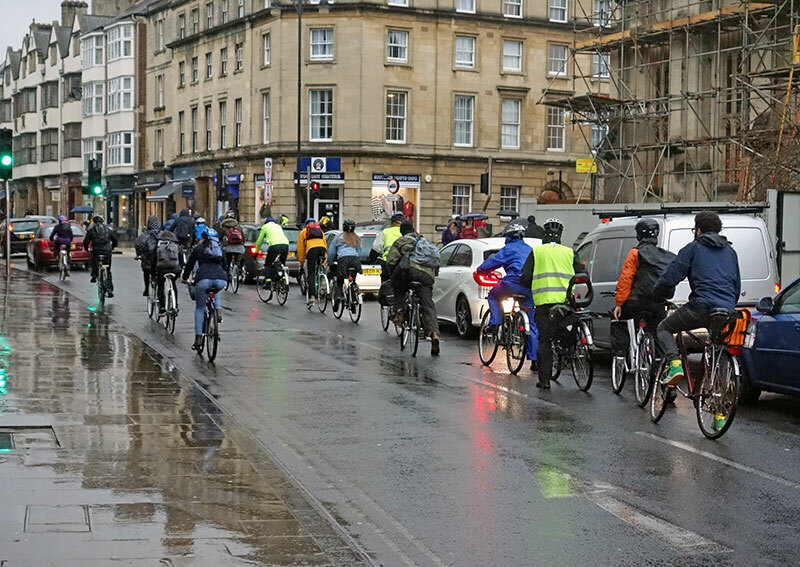 There was a time on the traditional Sunday club run where you would rarely come across cars, but now higher traffic levels have increased the problem of motorists and cyclists sharing the road. Impatient cars seeking to overtake. Cyclists riding two abreast will be more of a flash point with increasing traffic levels. Racing. As a racing cyclist, I’m always very conscious of traffic levels. In fact time trials are governed by a rule that if traffic levels increase above a certain density then the course cannot be used. Rising traffic levels will lead to roads being unsuitable, or at least not suitable on Saturday afternoon. You do feel the future for cycle races is everything early on a Sunday morning. As a cyclist you do become quite sensitive to traffic levels. The cycling idyll would be virtually car free roads, which are safer and more pleasant to cycle on. However, when you get out on the roads, it’s not always so bad cycling in higher traffic levels than you would like. There are still parts of the UK, where traffic levels are very light. Even in Oxfordshire some minor roads can be quite quiet through the day. That’s why I love living in the Cotswolds, miles of traffic free roads. I’m not sure I’d be brave enough to cycle in London. Good piece Tejvan,I live in Guildford and I am at a loss to know where the town plans to be in the next 5/10/20 years.With proposed housing developments circumnavigating the town there is no provision for any town centre road improvements because it is simply impossible with space constraints. Same in Shrewsbury – housing estates and business units filling the green space inside the bypass. Many arterial roads already slow/congested at peak times and pinch points (the river crossings and key roundabouts the worst) still no thought of creating decent cycling infrastructure. As for it being “impossible”, well it isn’t but that’s the mindset most people bring to the discussion. Here in Cardiff there has been investment in cycle routes over the years, there could always be more I suppose. There are signposted quieter urban roads for cyclists to use,but as these are not as direct cyclists often take the busier direct routes. Sometimes cycling on the country lanes can be frought especially on blind corners. Last Sunday for some reason the lanes on our ride were very busy and as a group we were often stopping to let vehicles pass.